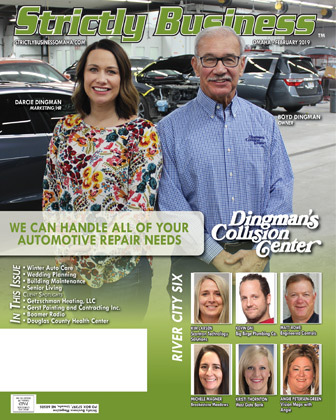 Dingman’s Collision Center (dingmans.com) is a family owned and operated business that has roots that go back to the 1960s. However, Dingman’s has been doing business in the Omaha metro for the past 22 years. Boyd and Diana Dingman opened their first location in 1997 in midtown. Over the years, they along with their children, Andy, Darcie, and Travis, have grown the business into four auto body shops and one mechanical shop throughout the Omaha Metro. Andy, general manager, is involved nationally with SCRS (Society of Collision Repair Specialists), bringing back all the latest in the industry so that Dingman’s is always up-to-date with vehicle repair procedures and the ongoing changes in the automotive industry. Each member of the team is dedicated to delivering the best customer service and the best repair possible to each of their customers. Dingman’s always believes in doing the right thing for the vehicle owner. It is Dingman’s commitment to ensure that all damage is repaired according to manufacturer specifications so that the safety is put back into the vehicle. Dingman’s doesn’t expect their customers to know the proper repair procedures, which is why they have ongoing training in all aspects of collision repair for their employees so that they can ensure that the vehicle is repaired according to manufacturer specifications. Dingman’s works with all insurance companies on the customer’s behalf to ensure these repairs are completed correctly and no shortcuts taken. They want to take all of the worry and stress away once that vehicle is on their lot. Dingman’s Collision Center stresses that every vehicle owner has the right to choose the shop of their choice to perform any necessary repairs after an accident has occurred. Many times, insurance companies recommend their preferred shops due to a business agreement that they’ve made with those shops. However, it may or may not be a shop that is the right fit for the customer. Sometimes, in the stress of a sudden accident, a vehicle owner may feel that they are not given a choice on where their vehicle will be repaired and they have to go with a preferred repair facility. This just isn’t the case. Vehicle owners, regardless of whether they are using their insurance or the other driver’s insurance, have the right to choose the shop of their choice. An accident can be very stressful, which is why deciding where you will take your vehicle before an accident happens can really save a lot of time and alleviate some of that stress. Call or stop by body shops and ask questions. Ask your mechanic for recommendations. Read reviews and find our more details about the warranty provided. Vehicles are constantly changing. The amount of technology in vehicles is incredible. Because of all the technology, repairs have changed as well. It is important to find a shop that has ongoing training as well as access to all vehicle manufacturer repair procedures. Dingman’s Collision Center wants to be your choice for auto body repair. Bring your questions and concerns to them. They are happy to help you in any way. You are their customer, and you and your family’s safety is their number one priority. Stop into any one of their four locations to experience the Dingman’s difference for yourself! Call any of our convenient Omaha locations! For more information, visit www.Dingmans.com.